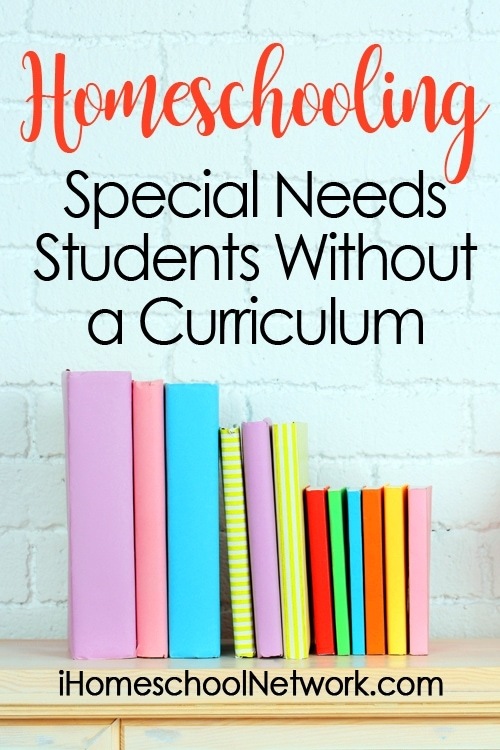 Homeschooling special needs students can feel intimidating, even when you’ve found the perfect curriculum that suits your child’s learning style. It’s even more intimidating when you either can’t find a good fit or you’re so bombarded with therapy schedules and doctor visits, that you wonder how to make one work. Not that long ago, I found myself in a unique situation that I never expected. Based on necessity, we had to make some changes. Not using curricula is something that I never considered when I started homeschooling. But being a mom of many, with several children of different learning abilities, we had to work around increasing therapy schedules and specialist appointments during a particular season. Our days were chaotic, and the idea of sitting down for even a few minutes to look at a teacher’s manual and organize worksheets, assignments, and specific books exhausted me. I needed to take some time to focus during this season, so we decided to take an early holiday break. Cared for our backyard chickens. Explored our property with magnifying glasses. Performed maintenance around the house. Listened to lectures on CD. Drew pictures from our nature study. Attended the occasional workshop, as our schedule allowed. Once things settled down, I opened the teacher’s manual to see where we’d left off. At first, I was nervous, wondering how much my children had retained, but my mind was quickly put to rest. I realized they learned skills that easily fit into science, math, English, History, reading, and handwriting. In fact, every single subject was covered! Sure, they weren’t covered in the manner laid out, but they were unmistakenly there. Whether you need a break from an organized curriculum or you’re going through a hectic season, try these ideas. We found an inexpensive set of magnifying glasses and spent time outdoors exploring our yard. Add in a notebook, pencils, and crayons so that your students can sketch new discoveries, combining science and art. Afterward, search online to name and label what they found in their backyard habitat. Even if you attend a class on a particular topic, the chances are good that your children will learn some cross-over material from other subjects. Whether you’re reading books or listening to audiobooks, you’ll find a plethora of choices. Some days we listened to an audiobook or audio drama while playing with play-dough, LEGO bricks, or coloring. The amount of material my children remembered amazed me. They also enjoyed listening to short lectures on CD. Is there a new skill your child wants to learn? Find someone in the area willing to do a short or long-term apprenticeship. I have a child who struggles with reading and writing but is a whiz at anything hands-on. Having someone teach him how to build a coop taught him math skills, enhanced his fine motor skills, and gave him a sense of accomplishment, boosting his confidence. He said he understood fractions because he used them in real life. We used this time to practice handwriting, spelling, and overall composition. The art of letter writing is disappearing, but it’s an excellent way to brighten someone’s day. If your young student struggles with writing, try using a dictation software program. Even when speaking, they’re learning to create topics and thoughts that fit together into a coherent letter or essay. What a joy to see that while we were going through a difficult time, all of our children continued their education and had a marvelous time learning new things. What about you? Have you found a time when you needed to implement non-traditional ways of learning? Sara Elizabeth Dunn is a Christian homeschooling mom to 7 and a Family Herbalist. Having both neurotypical and special needs children, ranging from preschool through high school, she not only understands the unique challenges of teaching several children with different learning styles and abilities, but she also has experience balancing therapy schedules with family life. Her passions include encouraging mothers, homeschooling, home remedies, and making it all less intimidating.